Cut the fish into large pieces. Peel and chop garlic. Saute fish and garlic in olive oil. Pour fish stock. 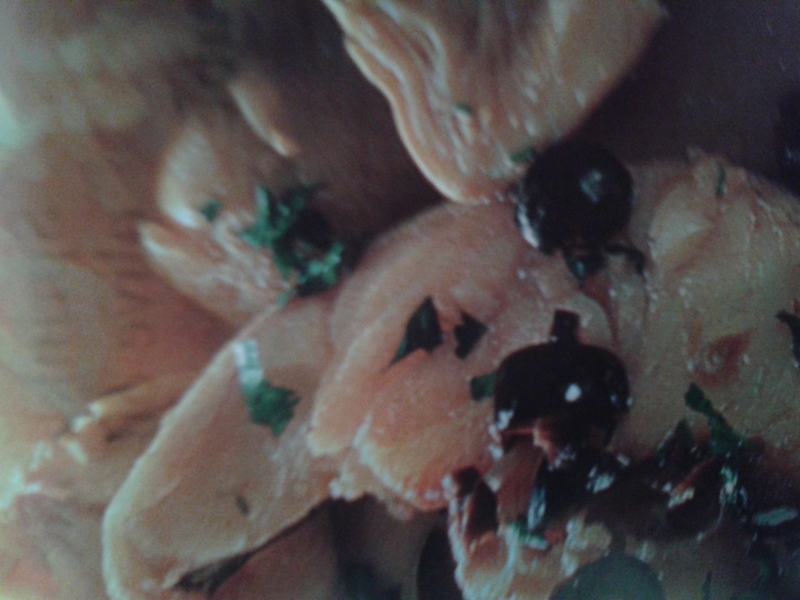 Boil fish for a few minutes, Chop olives and parsley. Sprinkle over the fish. Serve hot. A perfect dish for a quick lunch. Buddha Belly. The name itself intrigued me and I was curious to check out this new eatery. What added to the mystique was the fact that Buddha Belly is formed on the basis of a belief in 3 core principles: Healthy Food with Integrity – Using the finest, highest quality organic ingredients, with a complete rejection of preservatives, Innovation of Food and Dim Sum for everyone – to ensure the highest quality and finest dim sum is available to as many people as possible. Way to go! With these thoughts in mind, I entered the Juhu outlet. Small, but well laid out and appealing. The décor was simple but the place had a unique energy of its own. We began our meal with the refreshing Lemon grass iced tea- sweet n tangy, it perked us up. Chicken sui mai. 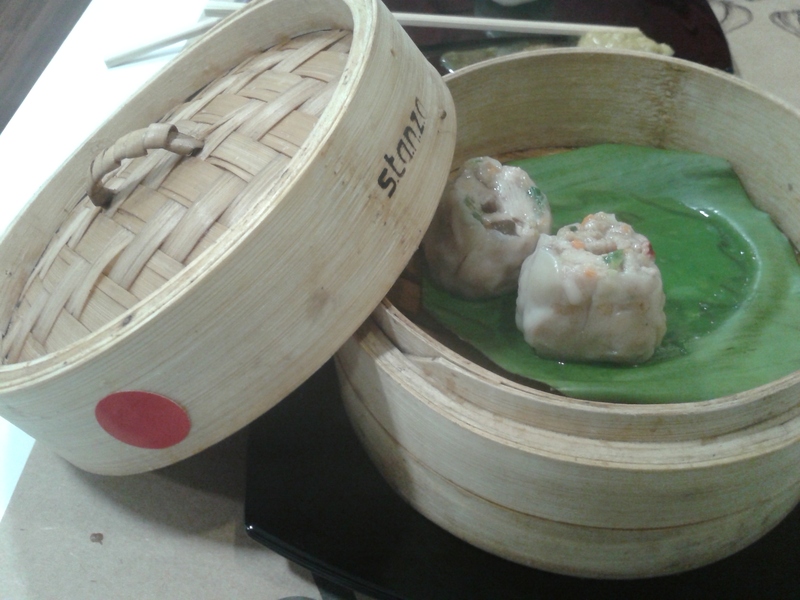 The steamed dim sums arrived in a basket. The aroma was appetizing and made me hungry. Soft and well prepared, the filling was delectable, as was the covering of the dim sums. Spinach prawns roll was unique and lived up to its appearance. Subtle flavours and the combination of spinach and prawns was a winning one. Full marks here too. The chicken and chive gyoza, although fried, was a treat for the palate. Each dim sum was better than the previous one. The quality was undoubtedly good. The dips served along were fiery but perfectly paired. 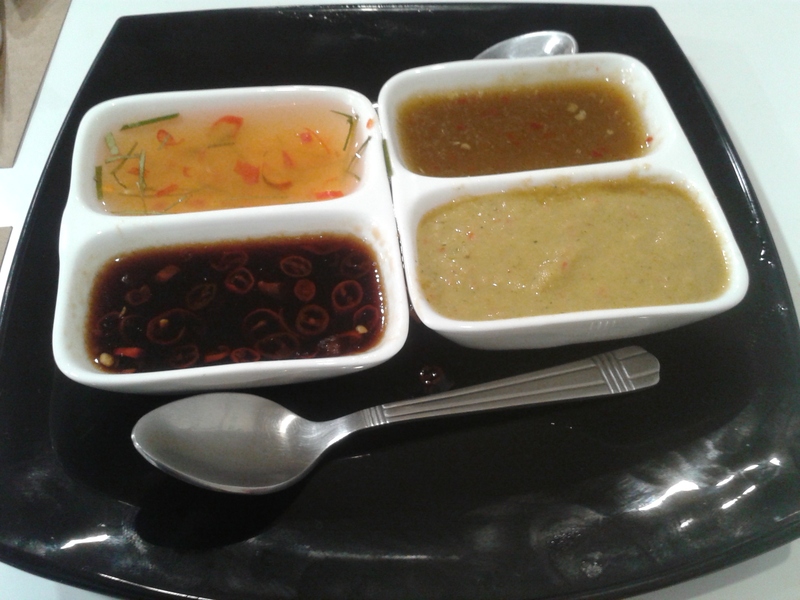 I particularly enjoyed the lemon grass one. Limited menu, but enough to satiate a dim sum lover, trust me. The brainchild of Arjun Singh Ahluwalia, Buddha Belly is indeed a haven for dim sum lovers like me. Shockingly affordable by today’s standards, the taste and quality are unparalleled. Chef’s famous Luo Bo Gao arrived next. Made with radish and carrots, the base reminded me of our own Kothambir wadi in Mumbai. And yes, it was as oily. The taste although outstanding, this one did not favour my palate owing to the high oil content. The lemon grass sticky rice which I always relish anywhere, bowled me over. It was authentic and flavourful to the core. Interestingly served too in a banana leaf. Kudos to the chef. Sadly, the chicken khao suey did not excite me. Presentation: full marks, but the flavours did not match upto the ones I usually enjoy. Disappointing. The coconut milk based gravy was too thick and bland. And yes, the boiled eggs were missing. cannot get the one I eat at Auriga out of my mind. 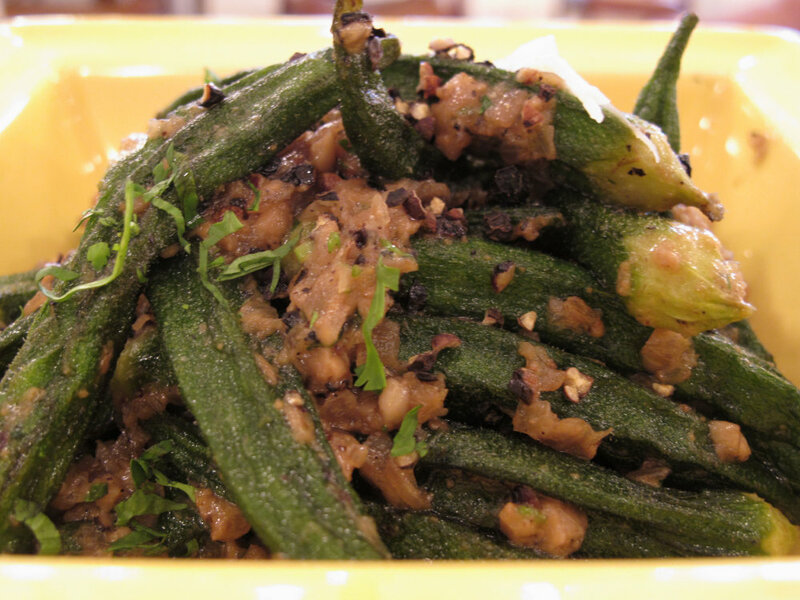 This one dish apart, it was an enjoyable culinary journey which I revelled in thoroughly. The staff is alert, cheerful and quick. Good food n paisa vasool. Passionfruit, nutella and coconut mousse are the three options from the chef’s stable. For a change I decided to skip dessert as I wanted the taste of the dim sums to linger longer. I have a special soft corner for MoMo Café, the all-day dining outlet at the Courtyard by Marriott across the country. 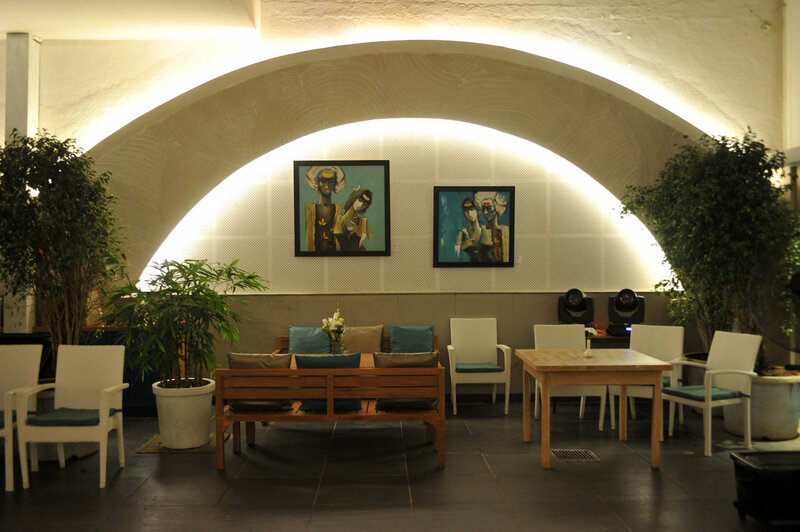 Free spirited, lively and cozy, it is a wonderful place to dine informally. And the fare is always exceptional, in terms of quality and variety. My first ever visit to Courtyard by Marriott, Hinjewadi Pune, so I was excited. But was certain MoMo Café could never disappoint me. And I was in for a surprise. A pleasant one at that. Executive Chef Aniruddha Limaye is a world class chef in my opinion. Skills apart, that gentleman has oodles of energy and passion and interacts with each guest at every meal throughout the day. We were treated to delicious local fare-tomato soup with coconut chicken sukha, prawns, varan-bhaat (dal and rice), usal et al. The flavours were incomparable. Each dish was painstakingly prepared with a home-style feel to it. Dinner was again a culinary treat, this time outdoors at the Al Fresco, with grilled meats and sea food. Grilled to perfection and paired with interesting dips, these tantalized our palates. But the best was yet to come. Chef Ramesh, who specializes in Italian food, treated us to a basa fish wrapped in potato spaghetti. I have never tasted anything more delectable than that before in Italian cuisine. Simply outstanding. The food at this Hotel is definitely among their highlights. The breakfast spread too is an exercise in choices. Something to wow every palate. The South Indian fare is worth a special mention. A variety of chutneys to go with the sprouts idli, burghul upma and of course the regular upma and medu vadas. The service at MoMo Café bowls you over. Every need of yours is taken care of by the warm and amiable team, even before you ask for it. Sachin one of the old timers, was truly a star as were many others. Kombadi cha rassa, this spicy Maharashtrian chicken curry made with dried coconut and onion is a must-have at MoMo Café. Curry-cut pieces of chicken are cooked in a thin brown, runny curry called rassa which is mouth-watering. This is best enjoyed with soft, warm chapattis, bhakri or steamed rice. I loved it with bhakris. Another favourite of mine is the Bhuna Ghosh aka a traditional Indian recipe of a delicious classic lamb curry made with lamb, spices, fresh fenugreek leaves (methi leaves) and bell pepper. What sets this apart is the bhuna part as this consists of pan frying the meat with spices without adding water. The meat cooks in its own juices which give the deep flavors. 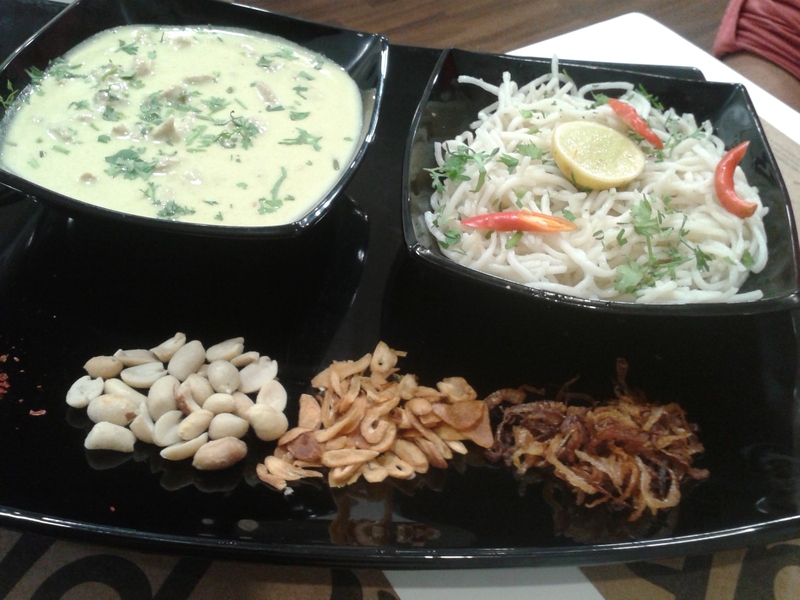 It was a wonderful stay at Courtyard by Marriott Hinjewadi and the food offerings made it even more special. I cannot wait to go back and savour the culinary wizardry of Chef Limaye again. No Hollywood, Only Pizza Please! Pizza is something I am always game for. For most if us, it is our comfort food. And a special menu called ‘Hollywood on Your table’ at California Pizza Kitchen, the fine-dining restaurant, sounded even more exciting. Hawaiian Chicken & Grilled Pineapple Pizza, Jamaican Jerk & Chicken Pizza, Deli Style Bistro Pizza are few of the new entrants in the much loved pizza menu. I was looking forward to these. My Mango Mint Ecstasy arrived first. It was a tad too sweet and doused with ice. The Spicy Sonora Pizza, was not a very great start. The salsa did not compliment the paneer. The home roasted corn, and black bean salsa, failed to tingle my taste buds. 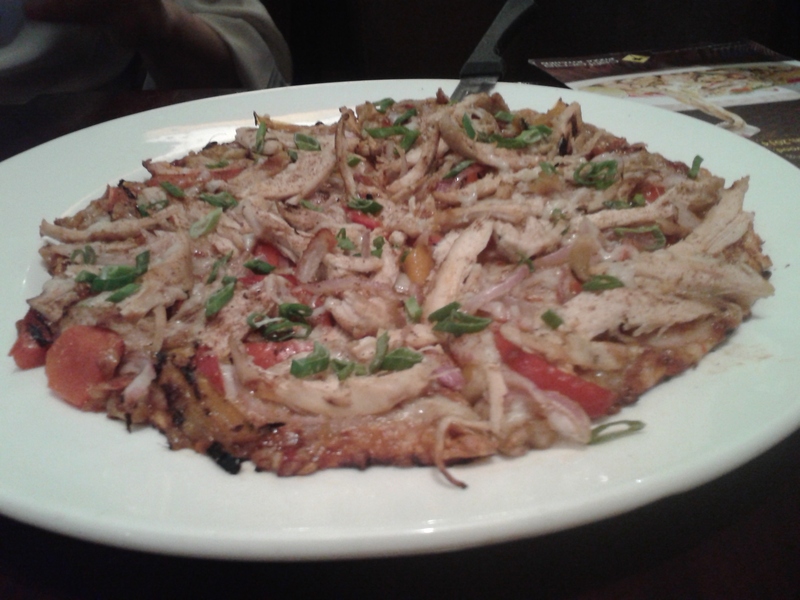 The chicken version of the same pizza, did nothing much to salvage our taste buds. The next one, Jamaican Jerk chicken was a lot better. Distinct flavours, pleasing to the palate. 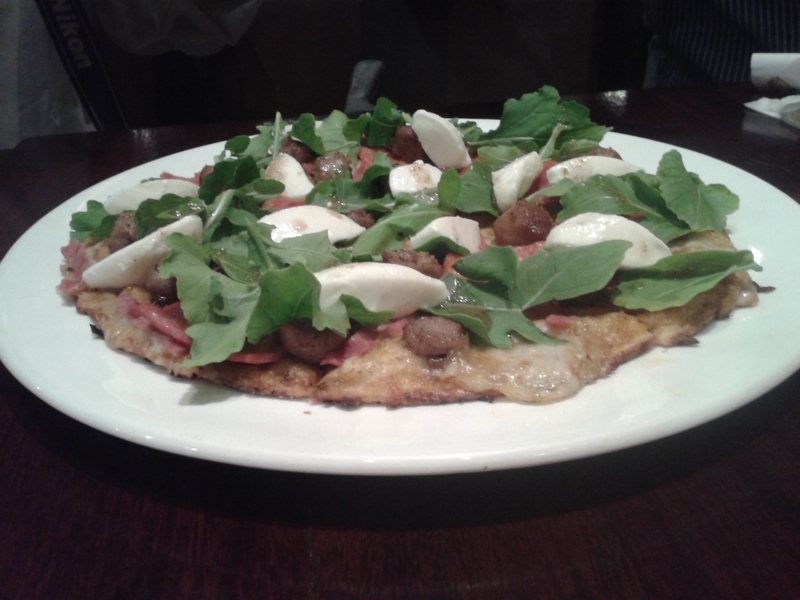 The Vegetarian pizza with oodles of spinach, was a pleasant surprise. Maybe because of the generous amounts of parmesan cheese, unlike in the other pizzas. Hawaiian Chicken & Grilled Pineapple Pizza came next. No scope to go wrong here either. Perfect pair as always. The highlight of the evening was the one which unfortunately came last – Deli style bistro pizza replete with capicola Ham, Canadian bacon, sausages et al on a thin, crisp crust. Alas! If this had come earlier in our meal. The new menu was a bit of a disappointment, or maybe I went expecting a lot more out of CPK, as I normally love their fare. Some pizzas were too bland and insipid, others had less cheese, or the sauce combination was not upto the mark. Too full, I decided to skip the pastas completely. Those looked appetizing though. Spaghetti Carretierra and Mediterranean Roasted Mushroom Spaghettini, are the new entrants. Check them out. California Delight 215, the desserts was the star of the evening. The white chocolate, strawberry and dark chocolate mousse with cranberries and almond prailine was delightful. The specially created menu will be available at California Pizza Kitchen starting February 24 – March 16, 2014. Pernod Ricard and Absolut partner with California Pizza Kitchen to ensure that Hollywood is a part of your drinks too!Men In Black will no longer be just a movie and Long Beach a place you want to visit –these are divine new mixes that are on their cocktail offerings. So hurry up and partake the Hollywood experience this week! New Way To Experience Coffee? Nah! Summer is here and Starbucks introducing flavoured beverages with green coffee extracts, seemed reason enough to visit the Malad outlet at Infiniti Mall, Mumbai. 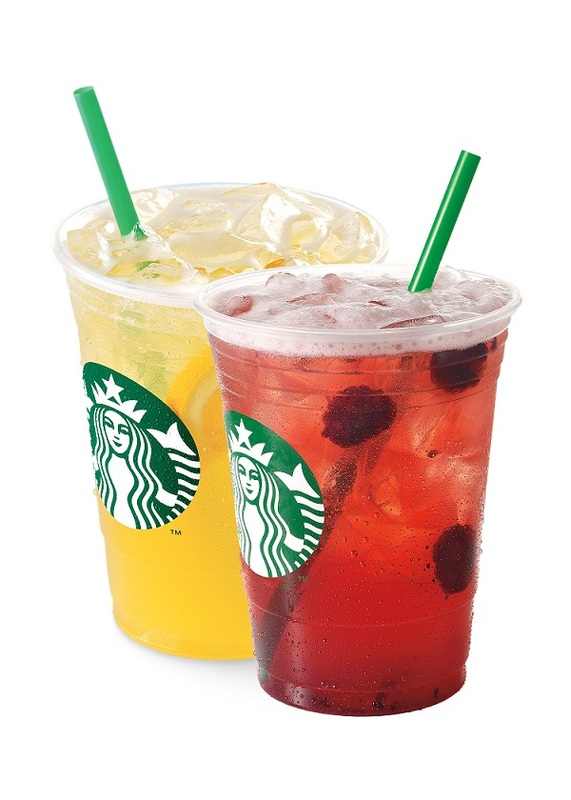 A unique offering, Starbucks Refreshers™ comes in two exciting flavours – Triple Orange and Very Berry Hibiscus. After a tiring day, I was all set to energize myself. Well, that’s what the refreshers were meant to do! Green coffee extract, a natural source of energy, combined with real fruit juice. The combination sounded winning and I was sure the results would be spectacular. My Very Berry Hibiscus arrived. The person serving me was quite evidently a trainee. He kept mumbling explanations about the drink- nothing of which was comprehensible. He turned to his senior colleague for help. He chipped in. Disappointing start. But that was not all. Meant to be a lively blend of flavors with tangy blackberry and Green Coffee Extract, it was anything but that. A few sips later, I was even more disappointed. Filled with ice, my refresher was diluted, run down and watery. I could almost taste nothing, except flavoured coloured water. Now only if the invisible green coffee extracts would energise me! Triple Orange seemed a lot better. I don’t know about the energizing bit, owing to the green coffee extracts, but it certainly boosted my palate and mood, with its effervescent, fresh and tangy flavours. This one got pass marks from me. Unlike the traditional process, green coffee beans used in these quenchers, are not roasted, which results in a mild and fresh flavor while still retaining naturally occurring caffeine. The flavor is very different from the traditional coffee. Well, I think I prefer my traditional cuppa for my dose of caffeine! Meant to be summer drinks, these are going to be on the menu till April end. The Starbucks Refreshers™ offering is meant to be the best pick of this season. I am not too sure about that. But their cappuccino definitely is! I am going back for that. There can be nobody happier than me that deGustibus Hospitality’s restaurants are moving to Andheri West and around. First Indigo deli opened at the Inorbit Mall and now Neel at Veera Desai Road. The year has started on a gourmet note for sure! The décor is minimalistic and simple and yet, spells class. 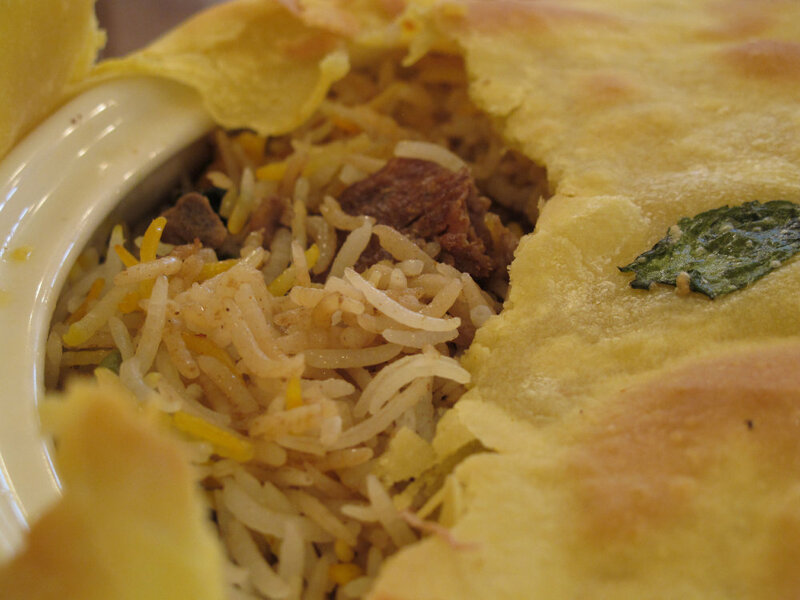 The food at Neel is all about paying homage to the rich and evolved cuisine of old Muslim Nawabi families from Lucknow, Hyderabad, and Kashmir. What appealed to me was the dash of modernity imparted to this otherwise traditional cuisine. A perfect amalgamation. Herbs and spices are carefully used to enhance the natural flavors of the food – not overpower them. The cuisine takes a lighter, modern approach to classic flavor combinations, creating sophisticated dishes that emphasize purity, simplicity, and seasonal flavors. Chef Mukhtar is truly a culinary wizard. The menu, as always is varied, with something for every palate. The Murgh Pashtooni Shorba (a frontier style chicken broth), we started with, was the perfect beginning to our gastronomical journey that evening. The aromatic flavours were soothing. A soup could not get simpler and yet be so delicious.Gilawat ke kebab came next and tingled our taste buds. Melt in the mouth, this kebab is my all-time favourite, but sometimes chefs don’t do justice to it. At Neel, it was a winner. The herb marinated Murg tikka chaarbagh was a real delight and was an absolute palate-pleaser. Vegetarians vouched for the unique Nawabi Baingan Tikka(stuffed baby aubergine). The slow cooked Kashmiri Gosht Roganjosh and of course the Kacche Gosht Ki Dum Biryani were the raison d’etre of our visit and wowed our palate as always. 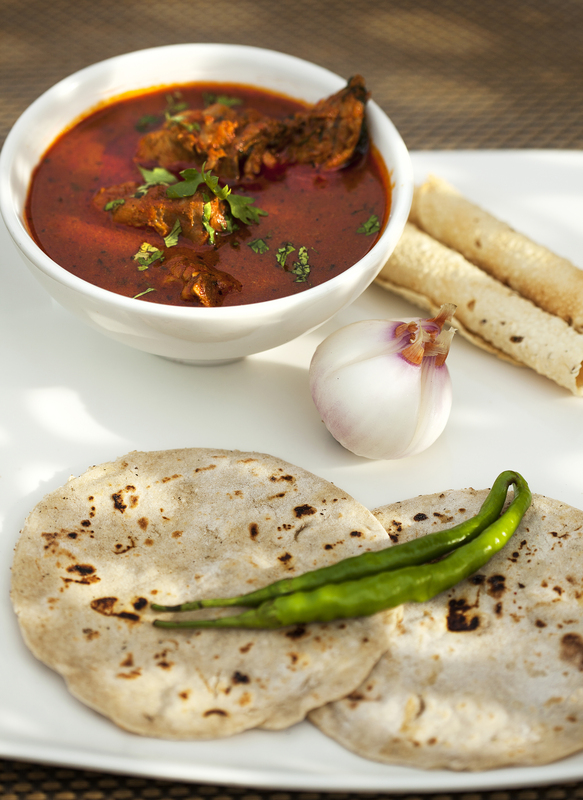 The varied Indian breads – bakhumaas and khamiri roti, paired well with the roganjosh and Kabul ki dal. The jhinga kairi panchforan was a pleasant surprise with its subtle spices and succulent prawns. Only the desserts disappointed me. The angoori rabdi was a bit too watery while the saffron in the kesar rasmalai was extra, imparting a strange flavour to this otherwise delectable dessert. The exhaustive menu apart, I am told, Neel will also serve fixed daily specials featuring a selection of exquisite, slow-cooked preparations like Dabba Gosht on Wednesday, Hyderabadi Haleem on Thursday and Nalli ki Nihaari and Kakori Kabab on the weekend. Got to go back real soon.